Here's a scarred old warrior for your Lord of the Rings collection! Dwalin the Dwarf hails from The Hobbit: An Unexpected Journey. 1:6 scale polystone statue stands almost 10-inches tall. Intricate detailing, right down to Dwalin's tattoos and the wear on his axes! Produced from a prototype sculpted by Greg Tozer of Weta Collectibles. Here's the scarred old warrior of The Company of Dwarves in director Peter Jackson's The Hobbit: An Unexpected Journey! The Hobbit An Unexpected Journey Dwalin 1:6 Scale Statue stands almost 10-inches tall and features remarkable detail, right down to the slight wear and tear on his axes, Ukhlat and Umraz. The polystone sculpture was produced from a Dwalin the Dwarf prototype sculpted by Greg Tozer of Weta Collectibles, a piece that took about 400 hours to design, model-make, mould, and paint! Notice the attention to detail on Dwalin's arms and scalp, including the angular and hard-edged design of his tattoos. 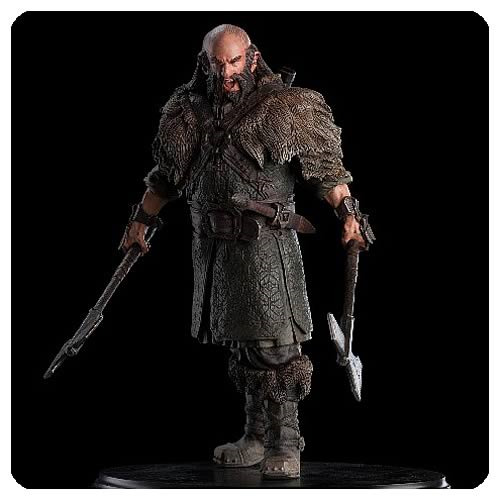 The statue's base measures 9-inches wide x 6-inches long, and The Hobbit An Unexpected Journey Dwalin 1:6 Scale Statue will look fantastic no matter where you choose to display him.